Vivid Reports CPM uses Microsoft Excel as its workspace to create and to view your reports. This enables you to harness all of Excel’s functionality with the added advantage of being able to distribute your reports as standard Excel files. With Vivid Reports CPM, you can drill-down into balances and view accounts and transactions instantly without opening another application. Perform variance analysis, statement verifications tests and much more, all within a familiar environment. A powerful and innovative reporting engine allows you to refresh and to navigate your reports with amazing speed. Developed on Microsoft SQL Server technology, it enables large volumes of data to be processed efficiently so you never have to waste time waiting for your reports to refresh. You create report definitions that are centrally stored, backed up and access controlled in the Vivid Reports CPM database. These definitions are based on six categories of financial information: Accounts and Segments, Periods, Fiscal Years, Data Types (Actual, Budget), Company (Database) and Currency. Each definition only needs to be defined once and become the building blocks of your reports. You can re-use definitions on multiple reports and only need to change it from a single location. Use your knowledge of Excel and its functionality to create your templates and budget models. All user input is done in Excel and automatically saved to the Vivid Reports database, where it can be instantly reviewed by the accounting department, senior management or shared with other users. Consolidate budget information and display your reports immediately without the complex and error prone process of manual consolidation, version control issues and delays with importing to your ERP. Use the built-in distribution tool to navigate and complete your templates. From a single screen you can view trends and historical information, see graphical representations and allocate annual input across periods based on the drivers you define. Add notes and attach documents/files to your input for better communication and documentation of assumptions. Budgeting at a transaction level is available. New budget sets can be loaded with any mix of actuals or other existing budgets, allowing you to develop forecasts more accurately and efficiently. The budget functionality can be used for more than just budgets. You can use it to load an external trial balance or G/L, load statistics or unit accounts, and even load elimination entries into the Vivid Reports CPM database. Adds functionality to define jobs and related tasks that can be applied to reports. Each job can be configured to automatically email, save or print the reports selected. This is used to easily distribute a set of reports to various users based on their unique requirements. It allows you to attach other files to an email making reporting more efficient. It can also generate a set of identically formatted reports across multiple files and worksheets, which can be used as budget input templates. Adds functionality to combine and to consolidate information in reports that span across multiple databases and companies. This can also be used to combine information from companies using different ERPs with different charts of accounts and account formats. The Currency Converter enables the user to convert reports to any selected currency. Ideal for organizations with multiple companies that have different functional currencies that need to be consolidated. Ending and average conversion methods can be applied to the companies and account ranges defined. In addition, the Currency Converter can be used with unit or statistical accounts to convert between different units of measure, i.e. miles to kilometers or pounds to kilograms. This feature produces a detailed lead sheet report that displays each line from a parent report along with a listing of the underlying accounts and related balances below each line. The lead sheet can be grouped by company/database and/or by segment and is ideal for auditing purposes and for distribution of highly detailed user reports. 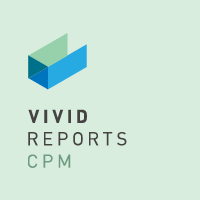 The Vivid Reports CPM Viewer user license includes the most commonly used features of the software and they have their own login and security profile. This user type can select what business unit and accounting period they want to view in each report using the control panel. They can also drill-down to the accounts and transaction levels. The number of Viewer User licenses purchased controls the number of user profiles that can be defined within Vivid Reports CPM. Everyone starts out as a Viewer and a license is required for each person in the organization who will be logging into or using the Vivid Reports CPM software. The Vivid Reports CPM Analyzer User license includes the core functionality and features of the software plus all of the modules purchased. This user type can view and analyze reports using all of the analysis features. They can also be administrators of the software and use Report Automation to push reports to other users. Adds the functionality to create new report formats and report definitions to an Analyzer. These features include the Row and Column Definition, Filter Control, and Filter Builder screens. Each installation of Vivid Reports CPM must have at least one Report Builder license in order to create and manage reports. The Vivid Reports CPM Server consists of the database and server side components that must be installed on a server running Microsoft SQL Server. This component is required for Vivid Reports CPM to function. There are additional server components required to enable the budgeting engine when Budget Input users are selected. Vivid Reports CPM is compatible with Microsoft SQL Server version 2000, 2005, 2008 and 2008 R2. 32-bit and 64-bit are supported. Enables scheduled data updates from the ERP to Vivid Reports CPM. For example nightly updates can be scheduled to run. Manual updates can be performed on demand as required. This module is used in conjunction with compatible image capturing software to display a transaction’s source document image within Vivid Reports CPM when drilled down upon. For organizations using the Dynamics GP Analytical Accounting module, this module will allow users to treat the Code dimensions like segments within your chart of accounts and create reports based on them. When drilling down to transactions users will be able to view Codes, Numeric, Date and Boolean information.